Mass Mail has a number of tools for reporting and analysis; indeed reporting is one of the key reasons to use Mass Mail. You can view a report for each individual mailing from the Mailings > Scheduled and Sent Mailings. These reports are based on live information about your data; you can track your emails in real time by refreshing the page. Each mailing report is broken down into a few sections. The availability of data is dependent on you enabling tracking of the items when you set up your mailing. The delivery summary shows some high-level statistics about the mailing. Clicking on the links in the Delivery Summary will show a list of the contacts that took the action. Intended Recipients shows the number of people that the mailing was intended to be sent to. Tracked Opens shows the number of people that jManage thinks have opened the email if you have chosen to track opens. Note: In the world of email, there is no 100% reliable way of knowing when someone has opened an email. jManage uses a trick that is common amongst mass mailers—it embeds a small image with a unique name in each email. When a client views the email and downloads the image, jManage knows that they have read the email. Because this technique is common, to protect people's privacy, most email clients ask users to confirm whether they want to download images in emails. Hence your report really tells you the number of people who downloaded the images; the actual number of readers is higher than the number reported. Tracked opens statistics should be taken as indicative, rather than accurate. In our experience, a 30% reported opening rate can be considered good. This is obviously different for each organisation and each group you send emails to. Don't focus too much on the absolute numbers, but rather use them as a way of comparing different mailings you send. You might want to use them to experiment with different layouts, writing styles, and lengths and see what works best for your constituents. Click-throughs shows the total number of times that people have clicked links in your email if you have enabled click tracking. Forwards show the number of times people have forwarded the email using the forward link (which is a token that you can include in your mailing). 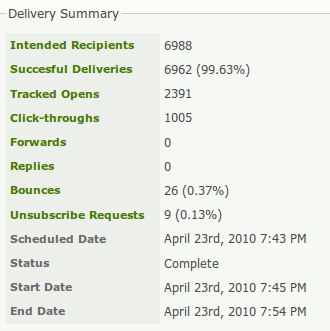 Replies shows the number of times that people have replied to the email if you have enabled reply tracking. Bounces show the number of email addresses that could not be successfully delivered to if you have enabled bounce processing. Unsubscribe requests shows the amount of people that have clicked on any unsubscribe links that you include in your email. If your server is set up to process bounces, contacts will be marked as On Hold when their email bounces. Further messages to those addresses will be suppressed. You can search for emails that are on hold either from the Bounces report or with an advanced search, and then investigate why the emails are bouncing. For detailed information about Bounces and Unsubscribes, please open a support ticket and ask for access to your Send Grid account (Send Grid is the extra software included with your jManage subscription that further protects your Mass Mail). In the Mailings area of Search>Advanced search you can search by bounce type. In this section, click-through statistics are shown for each link. There are two statistics, Clicks (i.e., the number of times that a link has been clicked) and Unique clicks (i.e., the number of people that have clicked on links). In the world of email, there is no 100% reliable way of knowing when someone has opened an email. CiviCRM uses a trick that is common amongst mass mailers — it embeds a small image with a unique name in each email. When a client views the email and downloads the image, CiviCRM knows that they have read the email. Because this technique is common, to protect people's privacy, most email clients ask users to confirm whether they want to download images in emails. Hence your report really tells you the number of people who downloaded the images; the actual number of readers is higher than the number reported. Tracked opens statistics should be taken as indicative, rather than accurate. In our experience, a 30% reported opening rate can be considered good. This is obviously different for each organisation and each group you send emails to. You can run the reports for multiple mailings. You have access to all the other cool features of the Reports area, including the ability to add reports to dashboards, get reports emailed, etc.